Zoey the Mechanic stands proud for a good job done. I am a contestant in the PetSmart Halloween costume contest and am certain that I will win. I entered the cute costume category, and as you all know, I am very, extremely, extraordinarily cute. 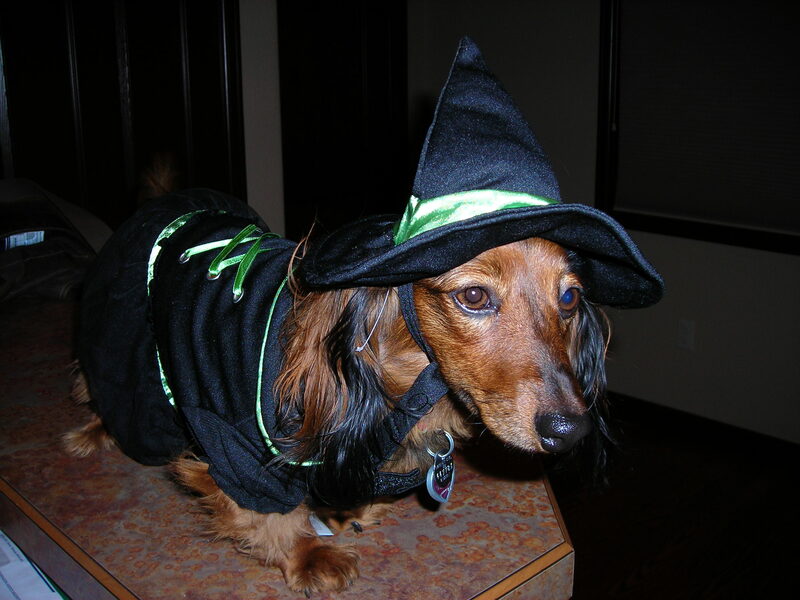 Shelley, my pet parent, first dressed me up in a witch’s outfit, but it hung way too low, because I am ultra thin and fit. She got her friend, Tim, to help with the second costume, the mechanics outfit I wore last year, plus a frilly bow on my ear. He held me while Shelley took super model puppy photos of me. I admit that the use of treats helped with my turning my head just so and standing on my hind legs. Yep, I like food, and I can keep my puppy-ish figure too. Zoey in her witch's outfit. 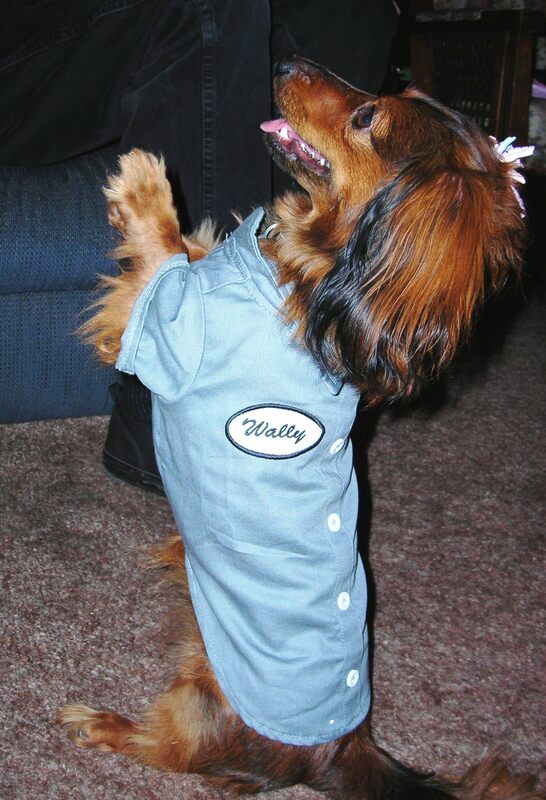 Zoey the Mechanic can fix almost anything, especially broken treats! The idea of “Be You” is easy for a dog. I bark when I hear a sound I don’t like. I beg when I see food I want. And I play when I want to play. I am who I am without trying to fit in or being someone or something else. I don’t have to be what a job or a classroom tells me to be, doing what is required for a paycheck or a grade. I can just do. But my Be You-ness is dependent on others. 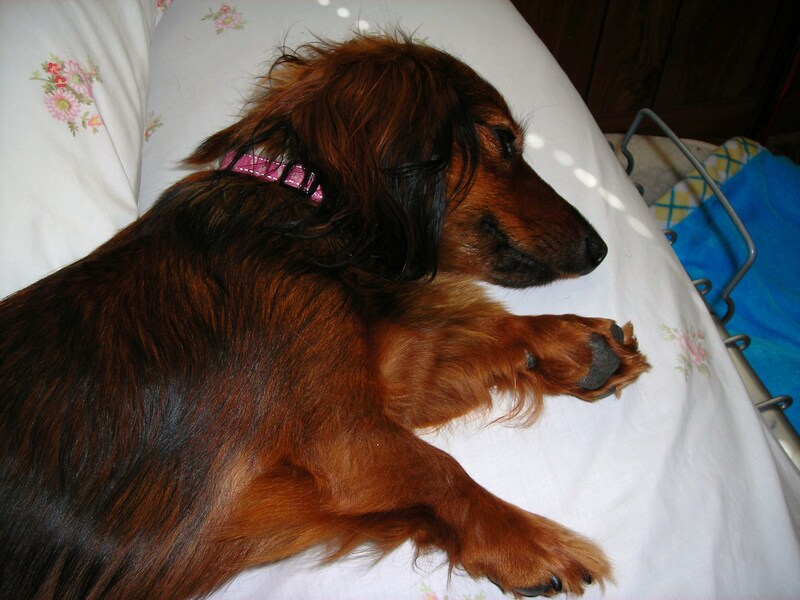 I am a social, and an exceptionally cute, dachshund who needs pets, attention and playtime. So I Be Sad when I don’t get my needs met. I need to be connected to others, both dogs and people, for games of chase, tug-of-war and make-believe band from squeaking my toys to make music. I certainly am not going to chase my tail or squeak my bunny or duck-y if no one is there to watch me be cute. I need observers and to know that I belong. I can’t sit at home all day, pretending that it’s okay for my pet parent to be working. I want her there with me. I can be my Be You when I am Being With Others. I can Be Me when I have you Being You being with me, because I am bred to be your pet. Zoey is taking a nap in a bit of comforter comfort. Zoey’s sick this week, so I thought I would share a poem I wrote after seeing a nine-week-old mixed breed puppy during one of my interviews for work. 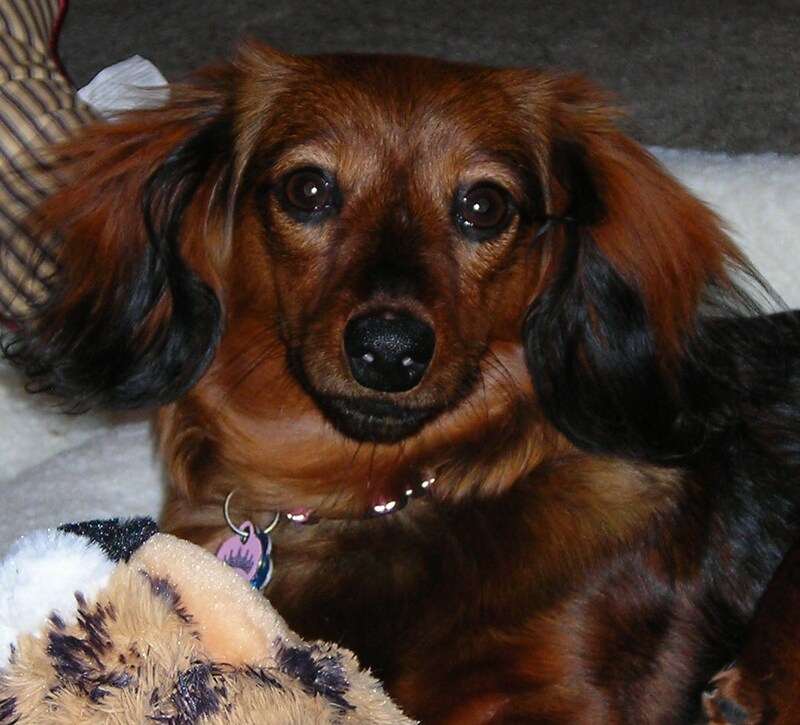 I had trouble concentrating on my notes when Lucy, who is the size of my 9-pound dachshund, sped across the floor, chasing balls, noises and anything that stirred the air around her. Though she’s almost three, my dog Zoey has retained her puppy side: she loves to play chase and tug-of-war, but she doesn’t prance. She loves to run around the yard, but she pants. And she loves to be naughty, but she stops when she hears “no,” at least for a few seconds. And then she’s off being her cute puppy self. 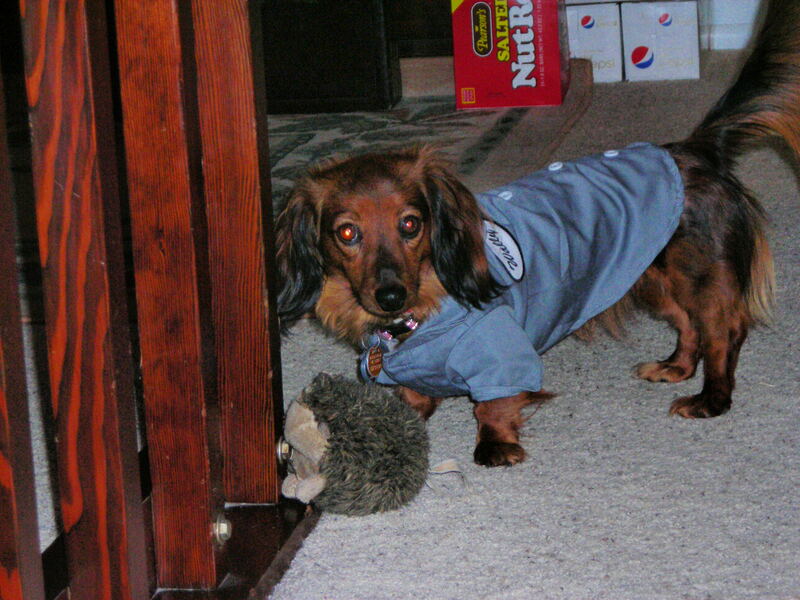 I am wearing my costume for Halloween 2010. Aren't I just about 100 percent adorable? 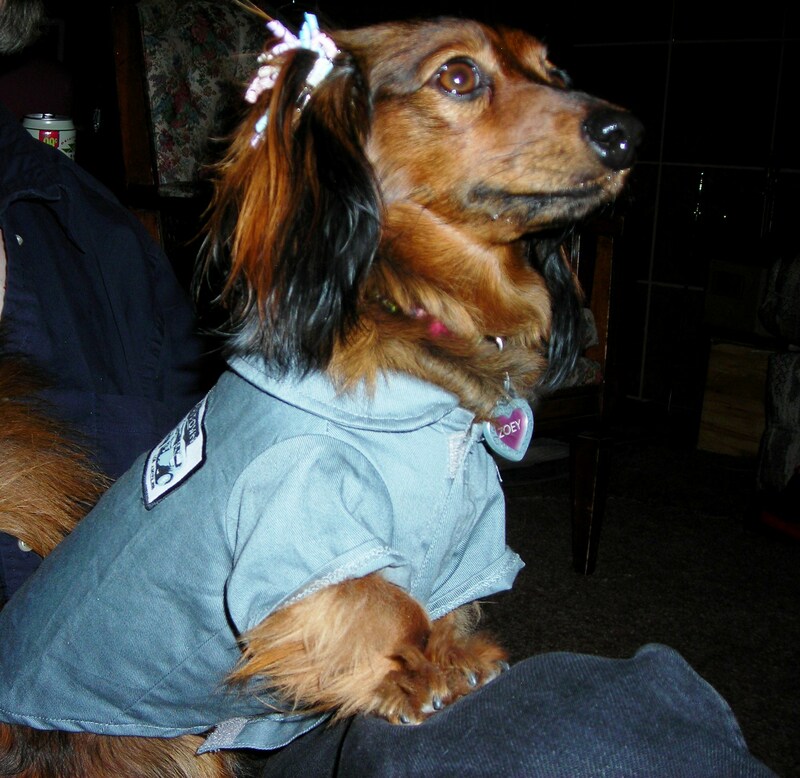 My pet owner, Shelley, is entering me in a cute dog contest hosted by Pet Smart. She’s submitting my photo (not yet taken) in the cute costume category in the Monster Cute Photo Contest. If I win (I should because I am ultra, super duper cute), I will be named Pet Smart’s next pet model and will be in a Pet Smart commercial. It’s fitting that I should model. Shelley won a contract with a casting agency after entering an American Mall Model Search. Like her, I know how to run the walkway and do a 180 turn when I find something to chase. I know how to show off my clothes on my thin, 9-pound puppy body. And I know how to pose for the camera. I wore a mechanics outfit for my costume last year, but I want to do something a little more girly this year, especially since I need to look extra cute. Shelley and I are trying to figure out my costume that she’ll probably make or embellish. I want to be a princess, but that’s so blasé for Halloween. There are so many princesses, plus I’m a princess the other 364 days of the year. The point of Halloween is to be something you’re not. I want to be a fairy, but I don’t do well with wings because I already fly when I run. I want to be Little Red Riding Hood, but I’m afraid my loud bark would scare the wolf. I guess that means a trip to Pet Smart to look for costume ideas. And no, I will not be a hotdog, even if my breed is dachshund.